David Rogers photographed a pangolin in August 2018 while on a Photos&Africa photographic workshop in the Okavango Delta and describes it as a highlight of his guiding life. 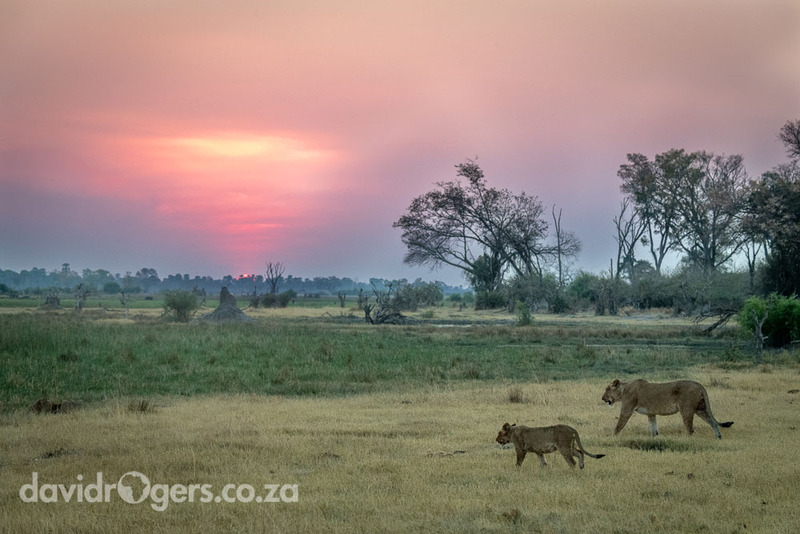 We had been photographing a group of 6 lionesses including two cubs drinking with a sunset behind and I was about to explain the usage of graduated filters to the group, but the alert on the radio that a pangolin had been sighted made us change our tack very quickly. We rushed to the sighting and I was delighted to see that it had not moved off. The Pangolin was fairly timid of all the commotion that it had caused but we managed to get some fairly good images. We spent a full 15 incredible minutes looking at this curious creature before it scuttled off into the darkness. 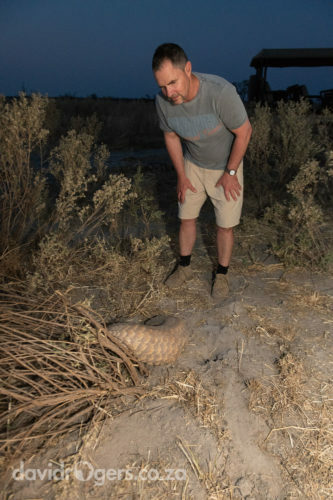 It was my first pangolin sighting out of more than 2000 drives over the past 25 years of guiding and photographing in Africa. It was also a first for our guide who has been guiding in Botswana for most of his adult life. As Pangolins are very threatened it seems wise to leave out the names of guides and also the lodge where it was seen but if anyone wants to get any more information they are welcome to contact me directly. Pangolins are nocturnal mostly and hunt insects particularly ants and termites using their strong front legs to dig into the ground and then sweeping up the insects using long tongues which are covered with sticky saliva. Their tongues can reach up to 40 cm! Although their eyesight is poor they have very good hearing and sense of smell. The word pangolin is derived from the malay word pengguling which means “the one who rolls up” and is derived from their defensive posture which they assume threatened. Their bodies are also covered with large scales, which are made of keratin and basically the same substance as finger nails. Pangolins can, when threatened, also release a bad smelling chemical much like a skunk. Pangolin are classified as endangered as a result of habitat destruction and also trafficking. There are four species in Africa including an arboreal and ground nesting species. 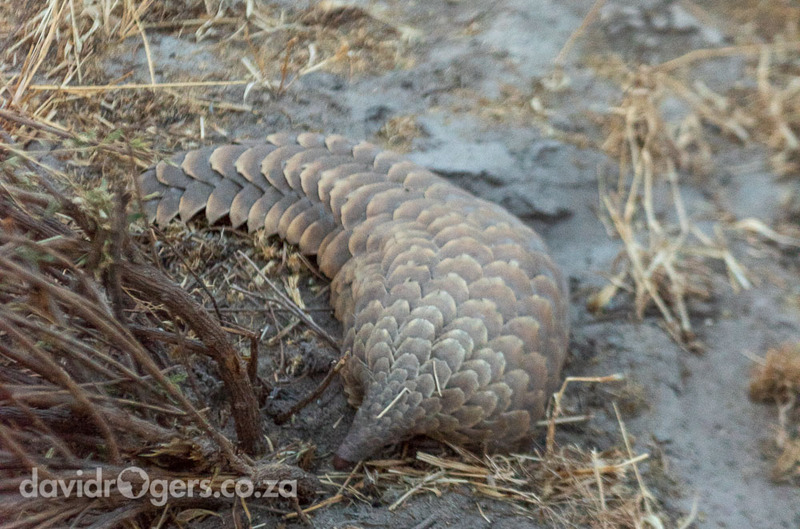 Our lucky find was the the ground pangolin Smutsia temminckii, which is rare and vulnerable. If you wish to see a Pangolin you have to be extremely lucky. I wonder if I will ever see one again in the wild in my life. 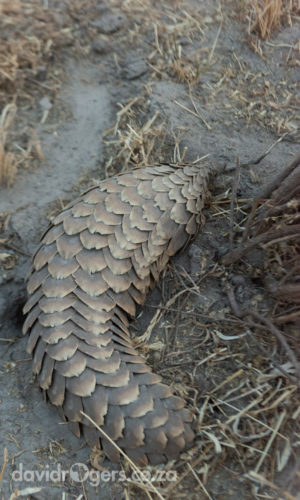 There is a pangolin at Wild is Life a rescue facility and wildlife sanctuary in Harare, Zimbabwe.